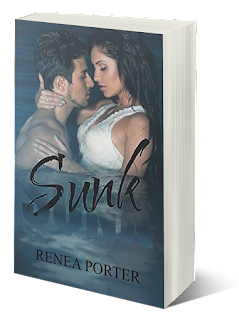 Sunk by Author Renea Porter is available on Amazon! When you lose all hope, what’s left to live for? There was no escaping it and no one to bring her out of it. The burden of loss weighs heavily on her, reminding her every day that there are no guarantees in life. Every day is a struggle, every day she puts on a facade just to get through. She’s already lost her husband to divorce and now her child in death…It’s all too much to grasp. But a chance encounter with Sly Wilkes is all it takes to come completely undone. Sly Wilkes is always in control, in every situation, including the bedroom. He’s mysterious, and Raine has definitely piqued his interest. However, getting to know her isn’t all that easy. Raine’s guarded and believes she deserves to feel the pain and the darkness that surrounds her. Renea has always had her nose inside of a book ever since she could remember. She has wrote ever since she was young, never showing anyone what she was writing. Initially she started writing Coming Back to You without intending to publish, but her hubby of 15 years encouraged her to publish it. And she did. She couldn’t imagine never writing. Its in her blood. Previous postCover Reveal for Distracted (Distractions #2) by Bianca Dean w/a rafflecopter giveaway! Next postCharacter & Author Interview featuring debut author Megan Gaudino’s Always Kiss Me w/a rafflecopter giveaway!